Why not get into the "spirit" in Munich? Try Munich beer halls for meals as well as for a stein of that famous brew. The locals definitely hang out there. You'll get proof of those local customers if you try to sit at a table with a sign in the middle that says "Stammish". That's where you'll see the locals hanging out. There are all types of restaurants and cafes in Munich, and they come in all price ranges. But in Bavaria, why not try the Munich specialties... Weisswurst, Leberkaese, and Schweinebraten. A Munich beer hall is about the best place you can choose to try a brat and a beer. If you just want a snack to soak up some of that beer, try one of the pretzels you can find everywhere... they're called "Brezen". ...and you're expected to share the table. If you see a free space, ask if the seats are taken and squeeze in. (Ask if they're "Frei" - just like in zimmer frei for rooms available). Don't do this at a table with that "Stammish" sign. Those locals are very protective of their table. Look for a locked cabinet nearby. They also often keep their beer mugs locked up in little cages just waiting for them in their favorite beer hall. How Will You Be Served? In most Munich beer halls, you will probably be served at the table. If you don't have someone come after a few minutes... head for the bar and order. These beer halls are associated with a single brewery... the big ones are named after their brew, so unless you want a wheat beer or a dark beer... if you order just a beer, you'll get their regular lager. Beware The Size Of The Beer! You DO need to be aware of the size of the beer. You may be drinking out of a liter mug!!! Beer is served in half liters or whole liters... 1/2 liter = 17 ounces... a good size beer. Many Munich beer halls only serve 1 liter beers!!! That's 34 oz... Almost as much as three of those 12 oz bottle you get in U.S. six packs! Just so you know when you're ordering, a liter mug is called "ein Mass"... a half liter mug is "ein Halb". And that beer mug or glass is not called a "beer stein"
...it's a "Krug" or a "Seidel". 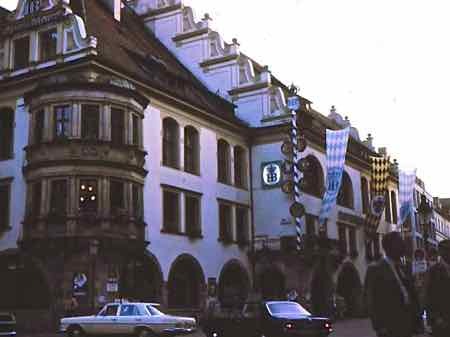 The most famous Munich beer hall is probably Hofbrauhaus. Some websites will warn you away because it's touristy... well, you ARE a tourist. There are plenty of locals there. And even though the oompah bands may seem a little put on, they're not. It just shows the local traditions are alive and well. And isn't that what you came for.... at least one time? Enjoy it for what it is. Our first time at the Hofbraushaus, we sat at a table with a slightly inebriated German. We weren't sure what to do. He decided to help us... and he ordered a meal and beer for us. That was probably the only time I will ever have pigs knuckles. It may not have been my favorite meal, but we sure had fun. 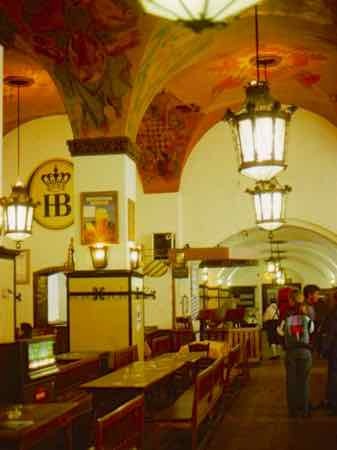 Some of the other beer halls are Augustiner Keller (or Gaststatte), Lowenbraukeller, and Donisl. In the summer there are also beer gardens. You can bring your own food as long as you buy a beer. They're good cheap places to picnic for the price of a beer. Just remember year round, you'll find good beer, food and fun in the Munich beer halls.